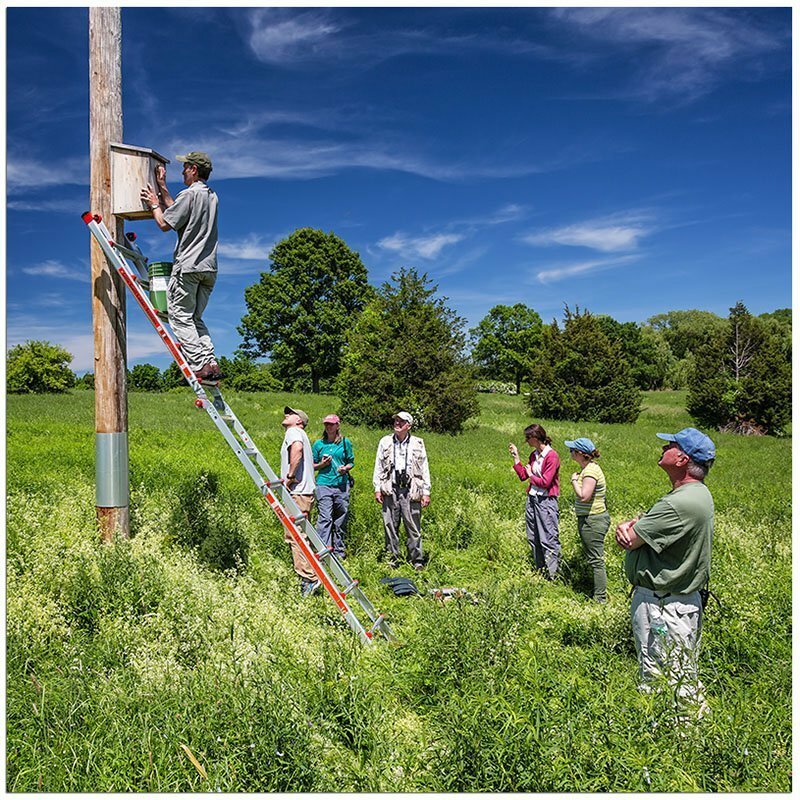 The Essex County Ornithological Club’s Kestrel Nest Box Program started in the fall of 2007 with the placement of a box in a promising field within the town of Newbury. 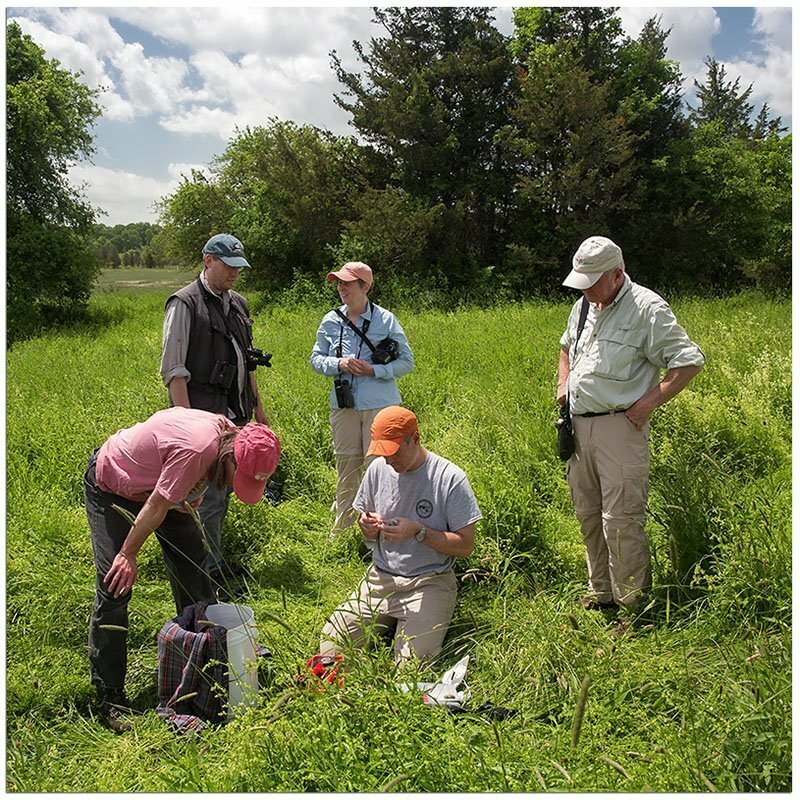 More boxes were placed around Essex County as the years went by with a dozen or so now installed and monitored each season. 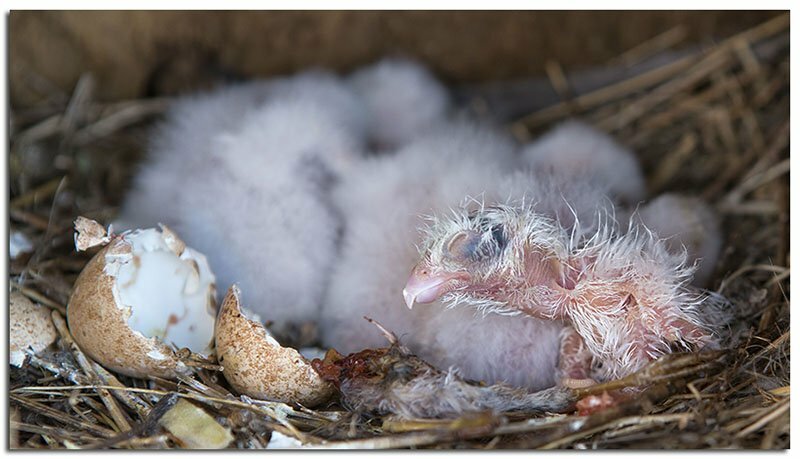 7 years later we’ve finally had a successful nest at Strawberry Hill in Ipswich. 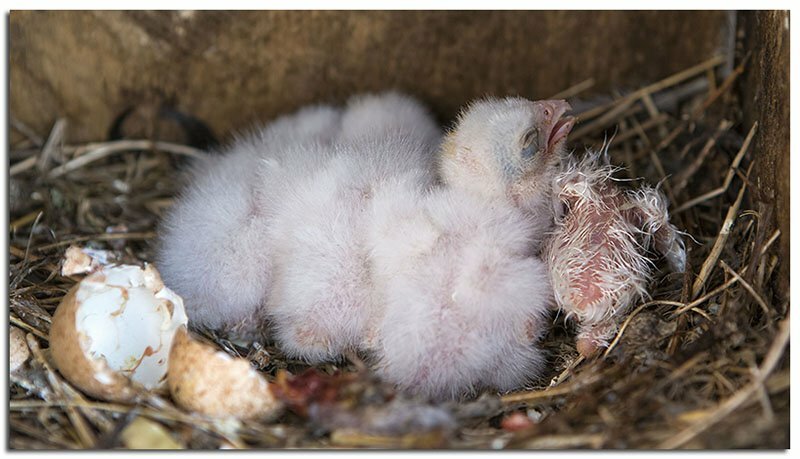 5 young Kestrel, 3 male & 2 female, fledged in early August giving renewed hope for future nest success within Essex County. 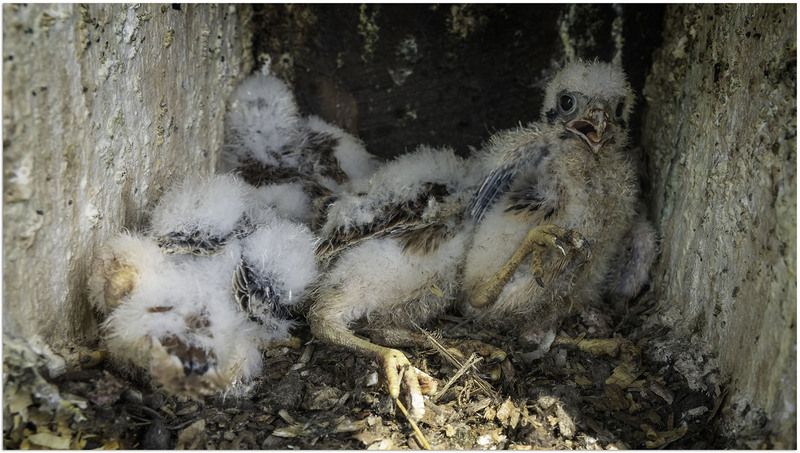 Hopefully this pair of Kestrels will use the location again after this seasons stellar performance of raising a full clutch of young to fledging. This was a late or second attempt at nesting by this pair as most nests are started a month or more earlier in the season. 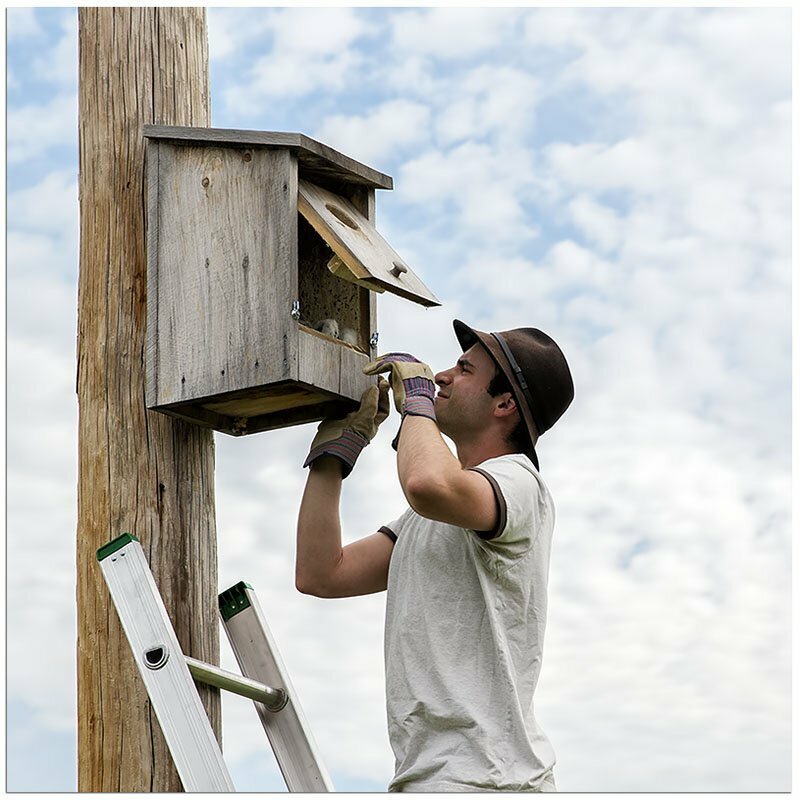 ECOC’s own Jim Berry alerted me to the pair using the box. 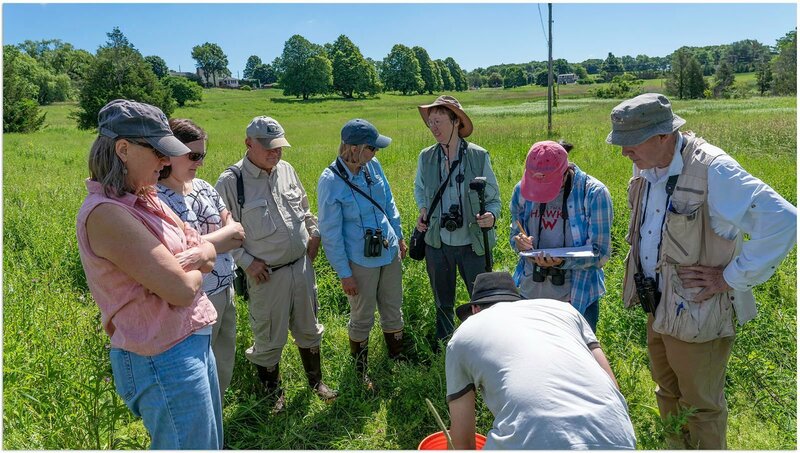 He came across them while monitoring the property with Beth O’Connor, Open Space Stewardship Coordinator for the Town of Ipswich, they were counting Bobolink nests at the time. Having just checked the nest box the weekend before I knew this would be a new nest as I had just evicted a pair of Starlings (for the 3rd time this season). A check of the box the next day found 2 eggs sitting atop the beginnings of another Starling nest. The Kestrels had evicted the Starlings this time! 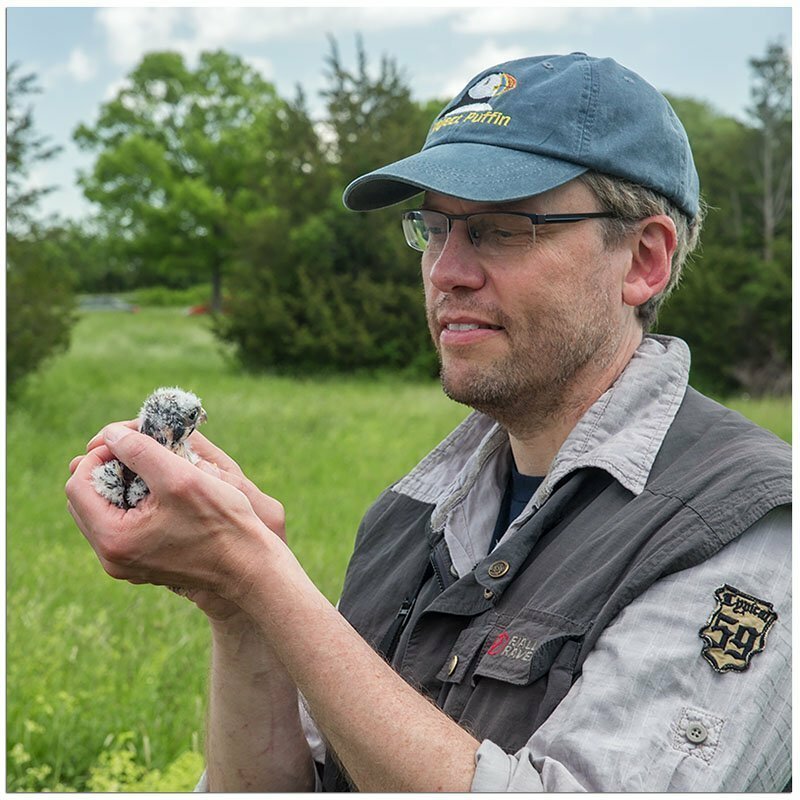 The box was monitored for activity through the month of June from a fair distance to minimize disturbance of the male and female and to determine if the pair were still using the nest or had abandoned the eggs. 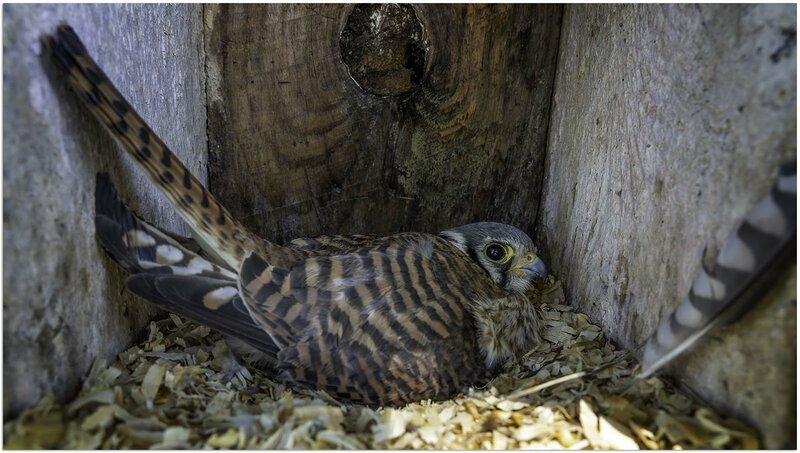 Approximately 30 days after finding the female sitting tight on the eggs another nest check was in order. Needless to say I was thrilled when I opened the box! 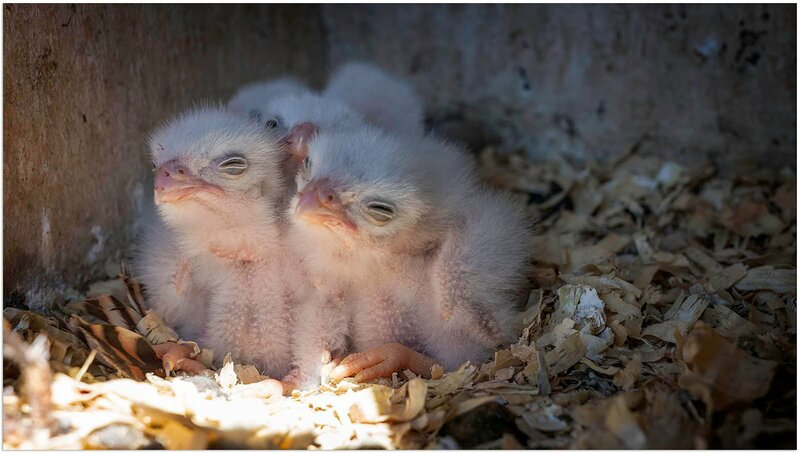 The young kestrel on the left below was no more than several minutes out of the egg with its older siblings having hatched one or two days earlier. 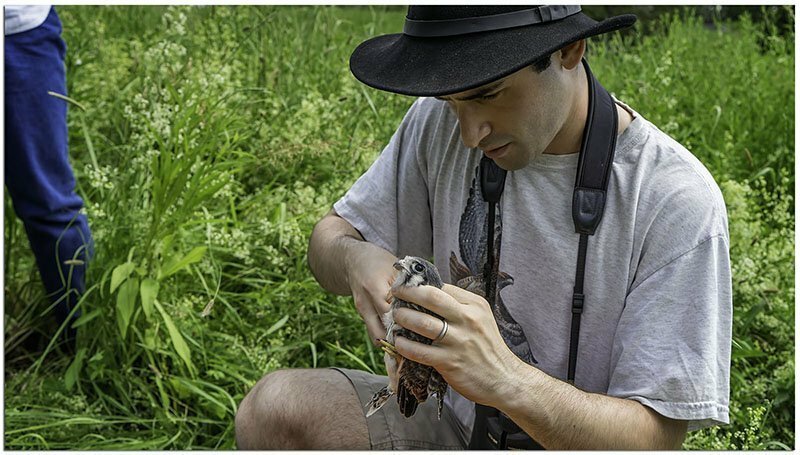 After a bit of calling around Joey Mason, a Kestrel bander / reseacher from the south shore put me in touch with Andrew Vitz, Massachusetts’s State Ornithologist, who agreed to come out and band the young Kestrels on the 25th. Drew Vitz on the ladder retrieving the young from the nest box. 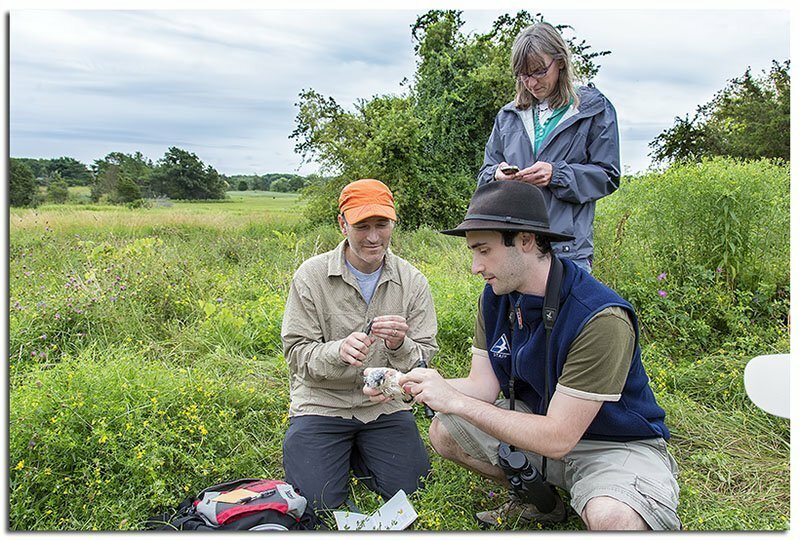 Matt Kamm of MA Audubon getting the gear ready, Jim Berry & Beth O’Connor looking on. Drew Vitz & Matt Kamm placing the federal band on one of the youngsters. 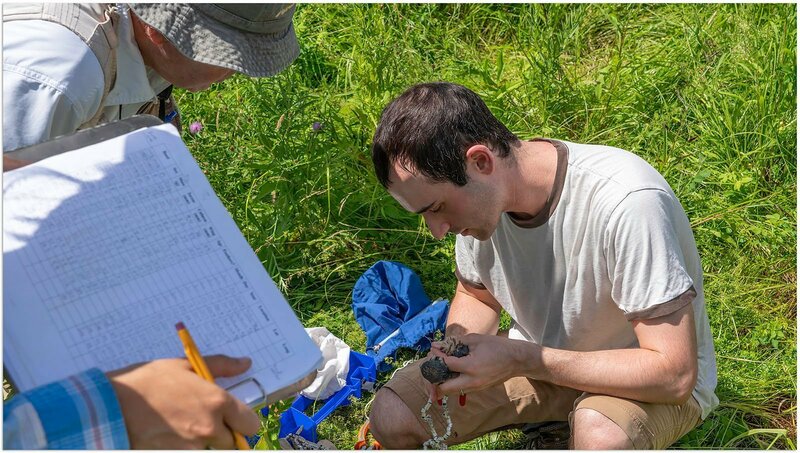 Drew Vitz (left) & Matt Kamm working on another of the young Kestrel with Beth O’Connor looking on. 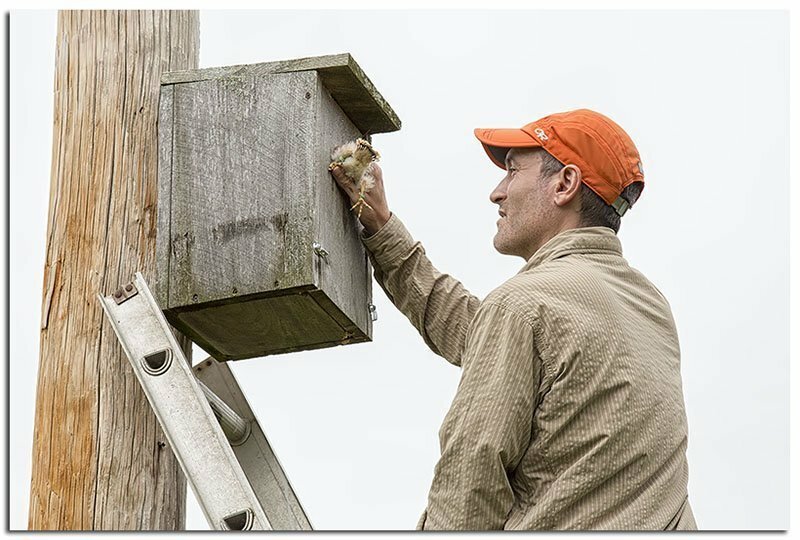 Drew Vitz placing a banded youngsters back into the nest box. 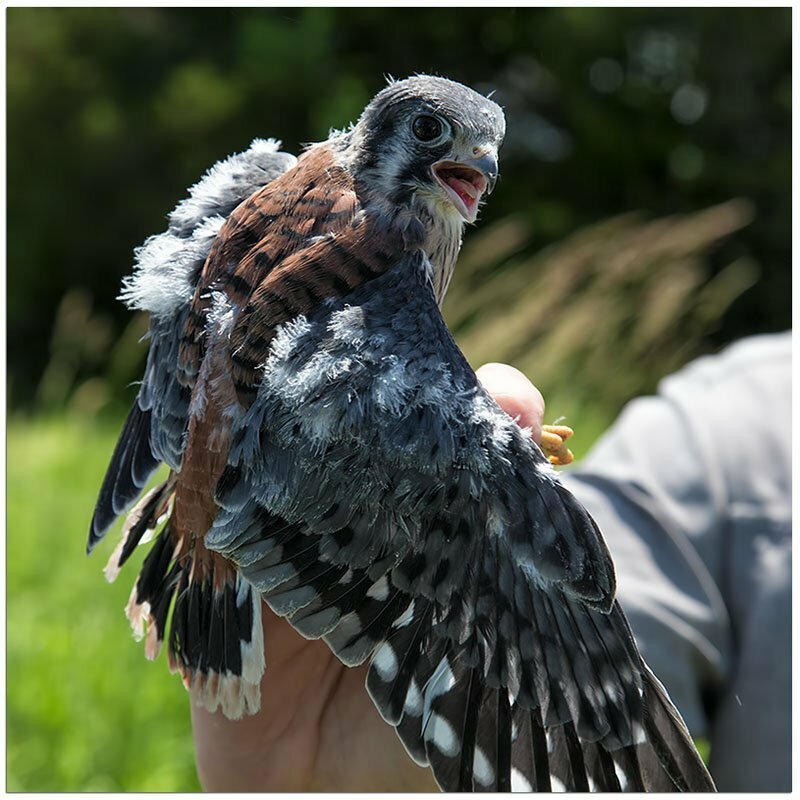 One of the young males just after being banded. Matt Kamm ready to remove the young from the box for banding. 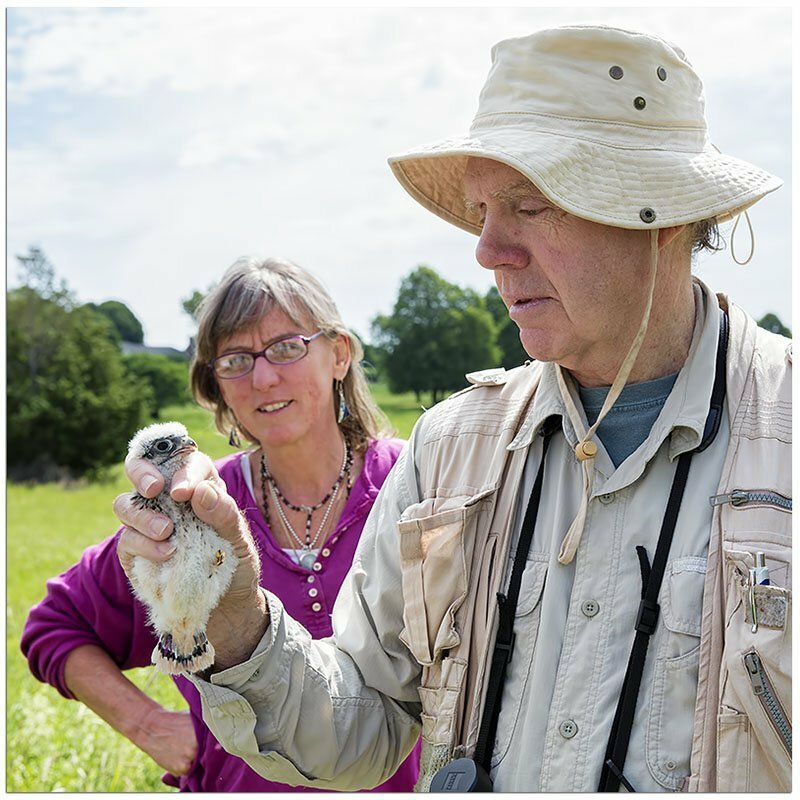 Beth O’Connor looking on as Jim Berry holds one of the young. 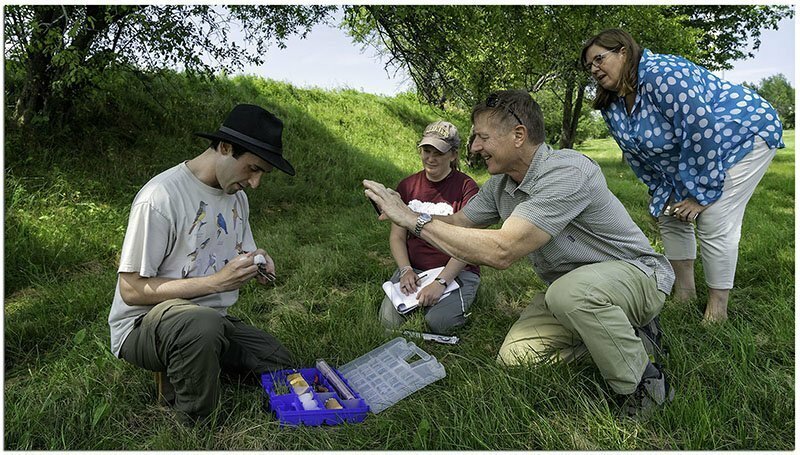 Drew Vitz, our State Ornithologist, banding one of the young. 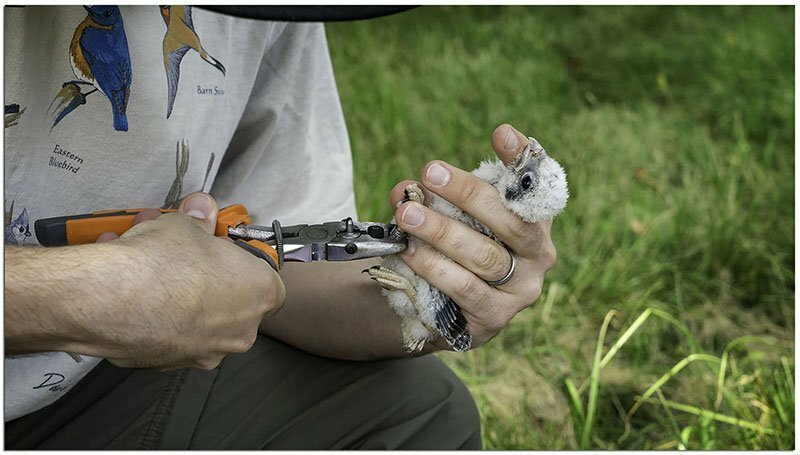 Drew Vitz working on banding one of the young with the rest of us watching. 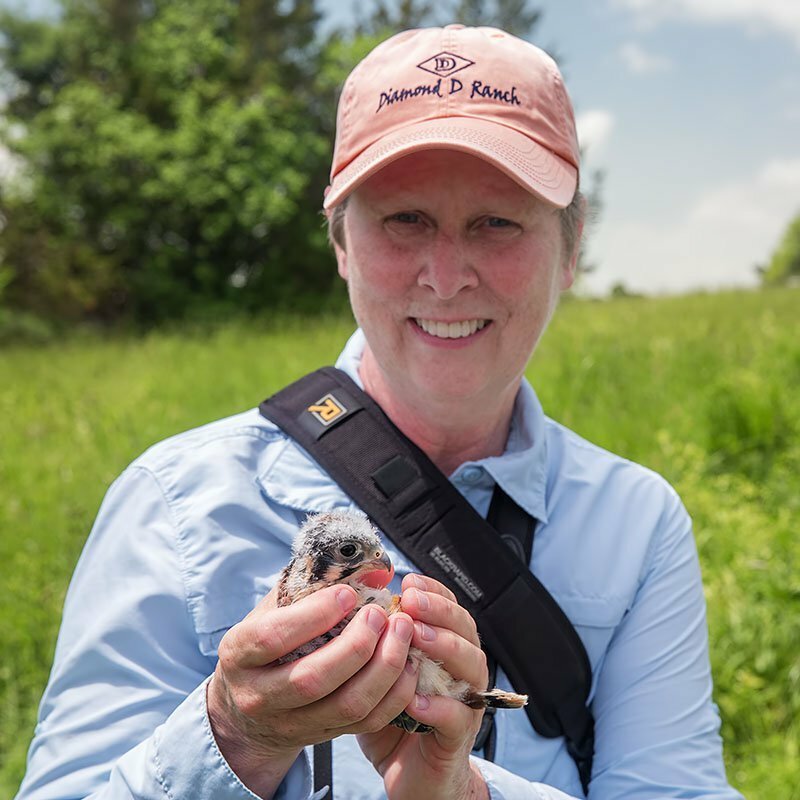 Margo Goetschkes holding one of the banded youngsters. A visitor from Germany enjoying a moment with one of the young. 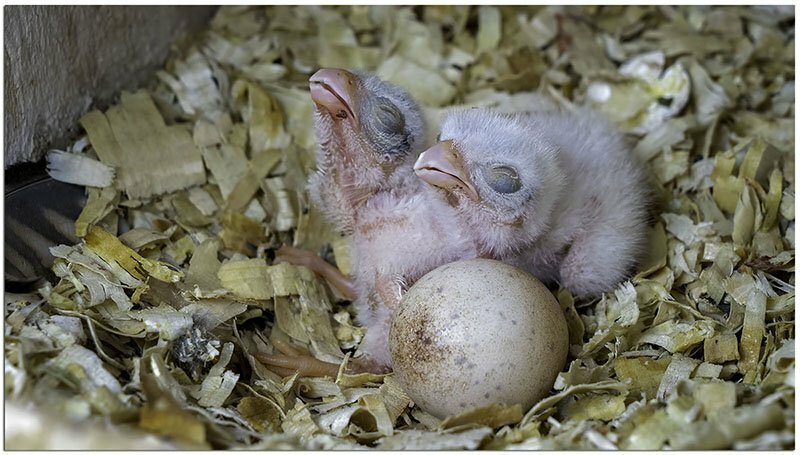 The two young Kestrel with the egg that didn’t hatch in late May. 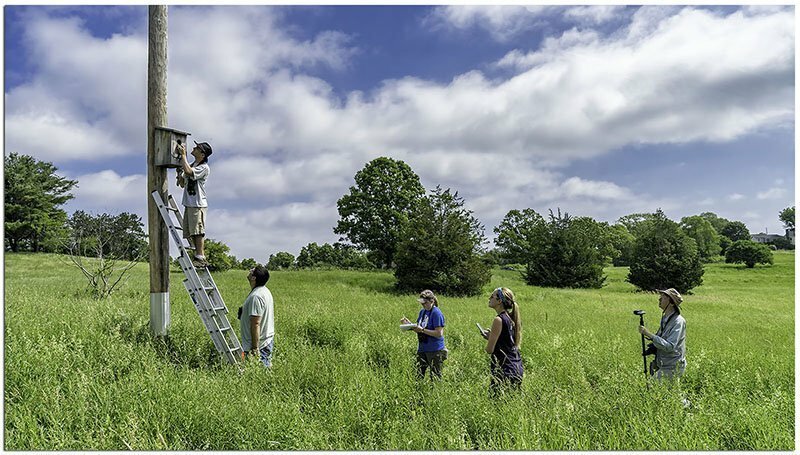 Matt Kamm on the ladder just prior to taking the young Kestrel from the box for banding. 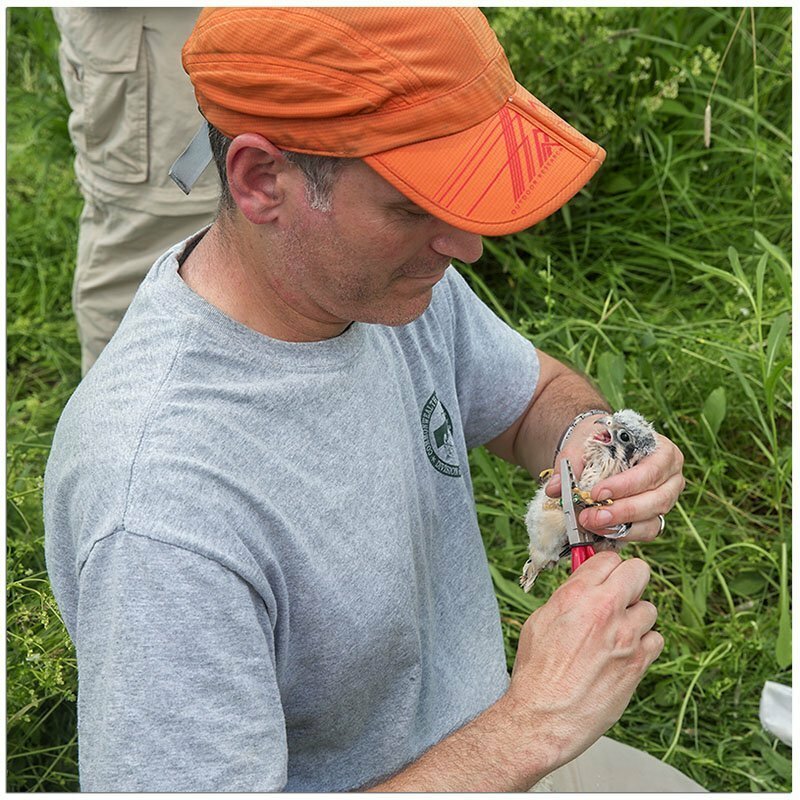 Matt Kamm banding one of the two young Kestrel. 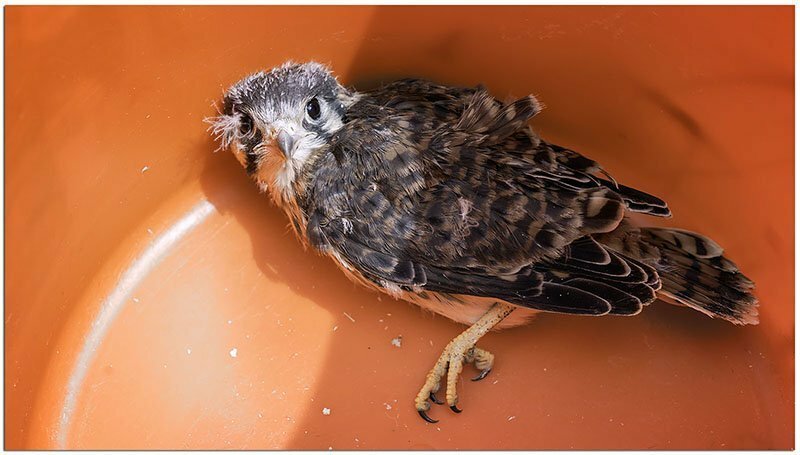 One of the young Kestrel in the bucket used to house them during the banding process. 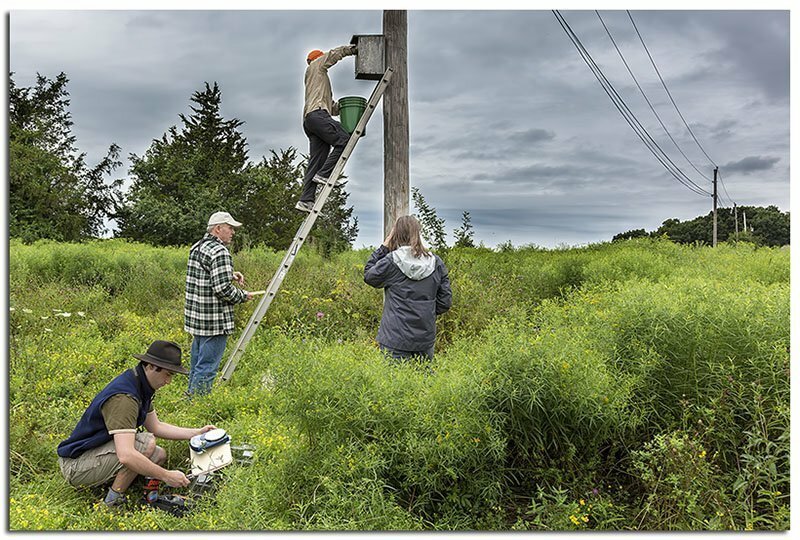 Matt Kamm with one of the young Kestrel with Mark Richey snapping a photo while others get a closer look. 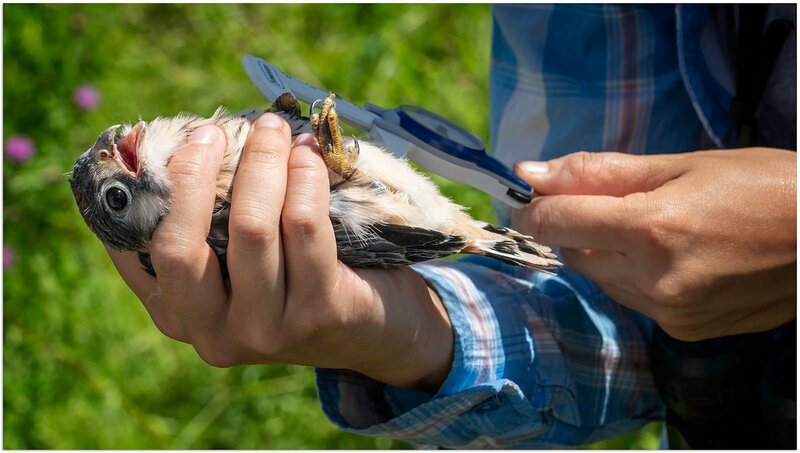 Matt Kamm measuring the wing chord on one of the young female Kestrel. 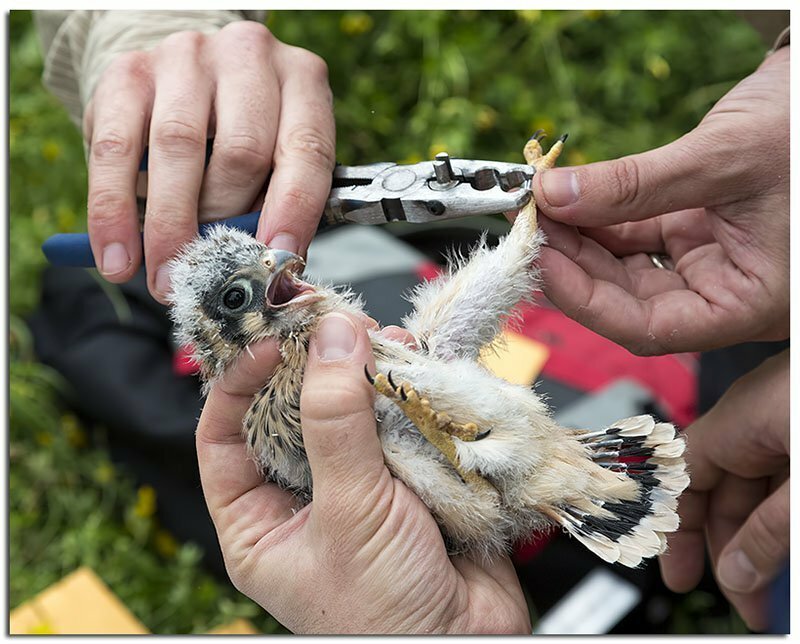 Matt Kamm putting the leg band on one of the young Kestrels. 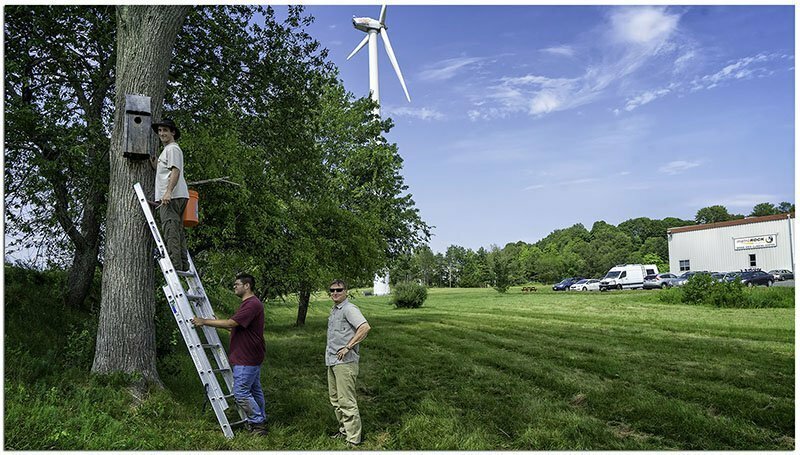 Matt Kamm on the ladder & his assistant holding it while Mark Richey looks on. 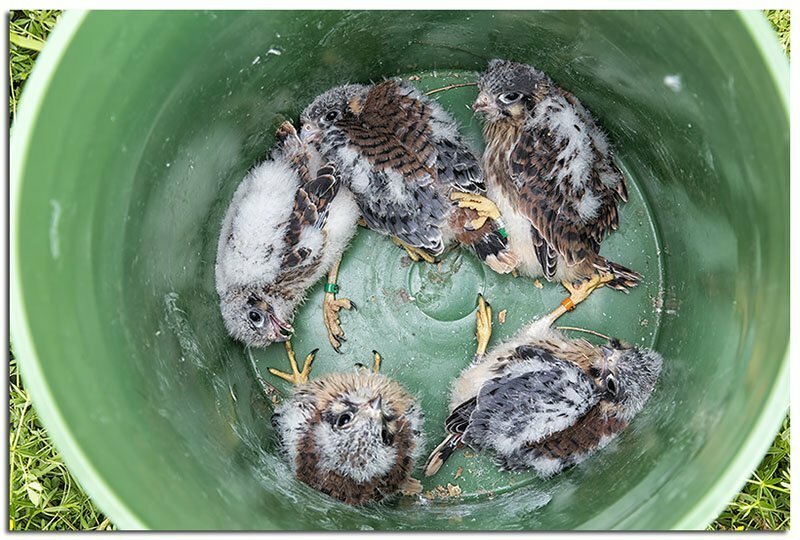 The young Kestrels on June 10, almost 3 weeks prior to banding. 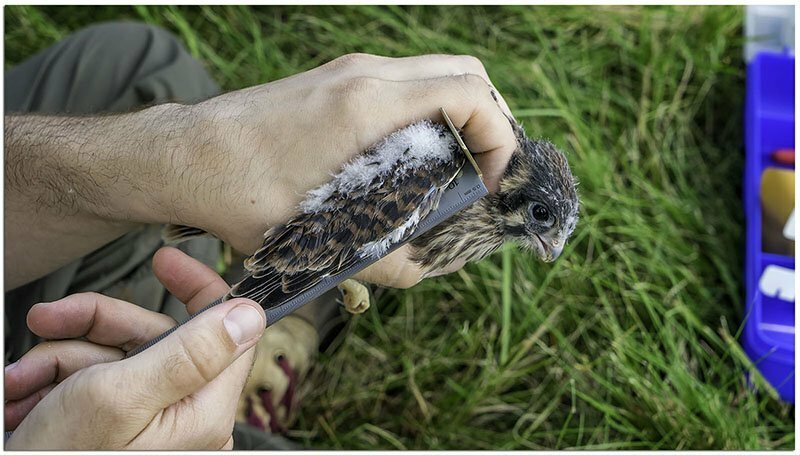 One of the young Kestrels being measured. The bander, Matt Kamm calling out measurements to his assitant with Jim Berry looking on. The group that came out to see the banding process.